Dementia is a feared word surrounded by a tragedy narrative. Understanding the experience of dementia, or as it is now clinically called Neurocognitive Disorder (NCD), can help shift our perspective. I know and see daily the challenges and suffering dementia and aging can bring. I also know and see daily the beautiful joys and learning it can bring, to those experiencing it and those that care about them. My perception of dementia holds both the challenges and the joy, they are not mutually exclusive. 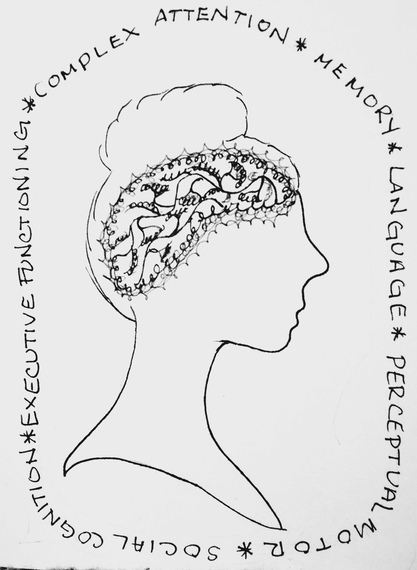 Six domains of cognition are used to paint a picture of dementia in the DSM, the psychological world’s guide to diagnosing. I will explain what the so-called ‘deficits’ in each domain look like. I challenge you to think about how these ‘deficits’ can also be teachers. There is more to the picture of dementia than can be painted by cognition alone. Keep in mind cognition, or thinking, is the easiest facet of the dementia phenomenon to measure and therefore is the basis for diagnosing. 1. Complex Attention: One becomes more easily distracted and has trouble paying attention and multitasking. In our fast pace media inundated world this can be very challenging. Creating a space where one can go at their own pace, and distractions are limited, can be very helpful (for those with and without a diagnosis). 2. Executive Functioning: One’s ability to perform tasks including planning, organizing and making decisions becomes more challenging. Simplifying the environment can be very comforting. Working together on projects can be empowering. As executive functioning decreases, an opportunity for simplification, learning to focus on one thing at a time, and interdependence are created. 3. Memory: This is the most well known cognitive change. In some circles dementia is even called forgetfulness. This is also the most relatable change — everyone has at one point or another forgotten something. In memory changes with dementia, the brain no longer remembers things the way it once did, nor does it learn things the same way. Recent memories tend to fade first and forgetfulness recedes back in time from there. Time becomes more fluid and specific details shift and lose their weight. When memory is not steadfast and linear the only truth becomes the moment. When we forget, we can learn to be in the moment more. 4. Language: Language shifts in three ways. The first two are a yin-and-yang of language, what are termed expressive and receptive language. Receptive language: The opposite; it describes when we hear a word knowing what concept it connects to. For example; the word fork does not connect in the brain to the object fork. These two types of language use do not change equally. Someone may have large changes in their expressive language and no changes in their receptive language or vice versa. The third way language shifts is in grammar and syntax. These shifts in language are many times tragically perceived as a loss of communication ability. Far from that, they are a shift in the way one communicates. Often in my experience, not having the precise word on hand, or having to describe things in a more poetic way, offers a closer representation of pure communication, adding to the message layers of personality and affect. If one can listen with metaphorical ears, beautiful moments of connection, rather than just frustration, are possible. 5. Perceptual — Motor: This means understanding what one sees, it has to do with how the brain and eyes speak to each other. For example; one may not be able to connect that a hairbrush is for brushing hair just by seeing the object. This can be particularly frustrating to both the person experiencing the shift and to those around them. This frustration mostly comes from a lack of understanding. Using curiosity to try to understand your experience and how it differs from who you are spending time with is imperative. 6. Social-Cognition: With the phenomenon of dementia there is often a shift in one’s social behavior. This can range from perception of others emotions to decreased inhibition. With a shift in social cognition there is less of a filter between thoughts, feelings and actions. All humans have thoughts and feelings that are not socially acceptable. These are often fleeting and most of us have learned not to verbalize or act on them. As social cognition shifts, and this filter becomes more permeable, one acts on these flashes of emotion. The beauty of this, is that one always knows where they stand, there is a deep honesty. It is important to remember that since these are in the moment, that is where they should stay. Just as quickly as our inner thoughts and feelings can change, so do the social behaviors of one with a change in social cognition. When they are acting angry, they are angry, when they are acting kind and happy, they are kind and happy. Decreases in social cognition offer a mirror for observing one’s inner emotional landscape; they also offer behaviors that can be very telling of unmet needs. In the phenomenon of dementia these six domains of thinking change at a different pace in every person. For both the person experiencing dementia, and their allies, it is important to understand these changes. When we can make meaning out of behaviors, it can alleviate anxiety and suffering. All of these can be perceived as ‘deficits’ but they can also be perceived as changes. Using this gentler viewpoint, there is room for the difficulty associated with these changes to be challenging, yet fruitful. Deficits call to be fixed. Changes call to be embraced and understood. Thanks for sharing this informative piece of writing. I know how challenging dementia can be and how important it is to provide a good treatment. Your article will surely help many caregivers and family members. Kyrie, this is a wonderful post, one which I’ll print out and read and re-read. So much good information, so well said. Thank you!